The Oak Hill High School Class of 1973 held its 40-year reunion on June 8, 2013 at Bob Evans Farm Shelter in Rio Grande, Ohio. There were 28 classmates and 9 guests in attendance. A covered dish meal was enjoyed by the class. The Oak Hill High School Class of 1976 celebrated a '32nd' class reunion on Friday, October 3, 2008, at the Oak Hill vs. Notre Dame football game. 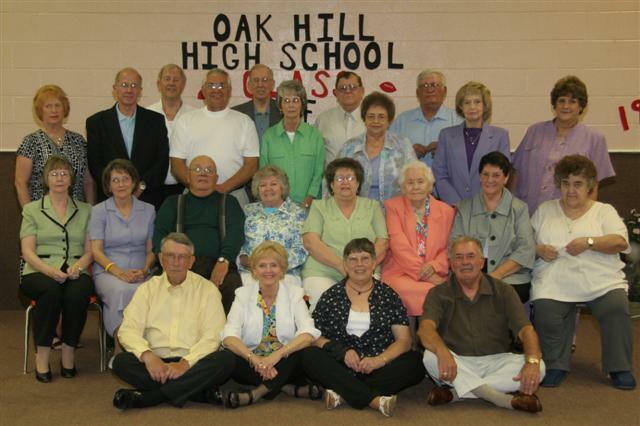 After the game (won by the Mighty Oaks) eighteen former classmates had an After Party at the Legion Hall in Oak Hill. Fun was had by all and tentative plans hope to be made in having a more formal reunion for their 35th year in 2011. 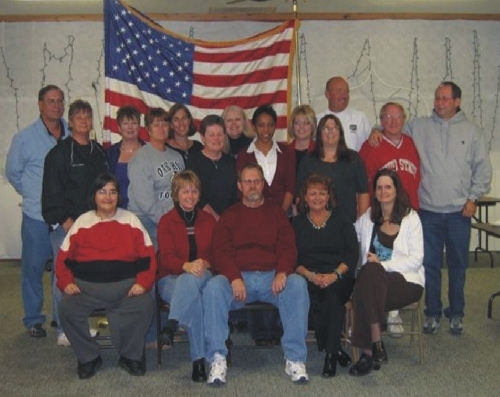 Classmates attending were, front row, left to right, Amy Howell, Michelle (Duvall) Boggs, Steve "Fig" Moses, Diana (Potter) Sims and LuAnn Kinnison. Back row, l to r, Dale Gilliland, Karen (Carter) Gilliland, Madenia (Dunn) Stafford, Rita (Lambert) Malone, Rita (Howard) Wiseman, Marsha (Thomas) McCorkle, Peggy (Metzler) Johnson, Hope Rippey, Vicki (Caulley) Midkiff, Carolyn (Miller) Curtis, Jerry Boggs, Jim Parsons and Jeff Queen. Photo courtesy of Patrina (Moore) Queen. The Class of 1958 was recognized during the Class of 2008 graduation. 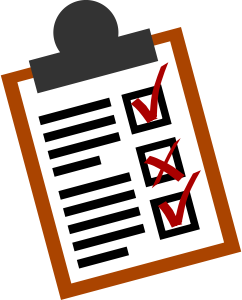 If you have alumni news or an upcoming class reunion that you would like to be published on our website, please contact the webmaster.